Barbarian frat bros. Rock and roll attitude. Fighting demon bad guys in the tomb of the undead. React! Games, an indie studio most noted for its mobile games, has come up with a fun way to share all these things with your most hard-rocking buddies from the comfort of your couch. 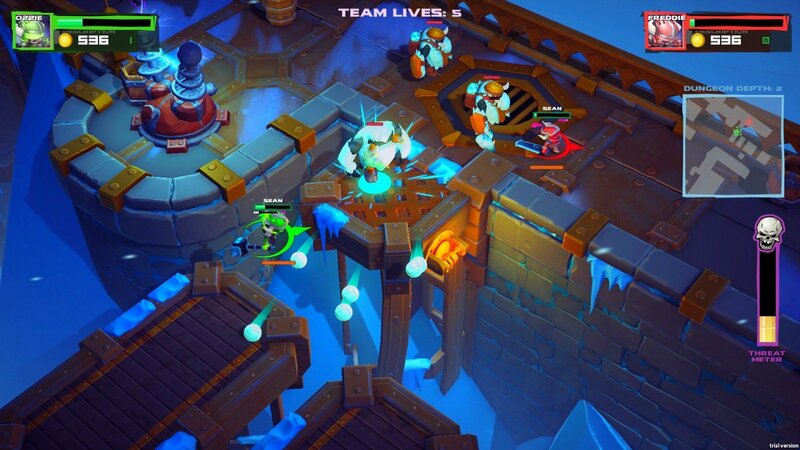 Super Dungeon Bros is a cooperative dungeon brawler that takes you to the medieval fantasy world of Rökheim. There, you and your bros will battle through hellish dungeons, find exotic loot and uncover the long lost Legendary Rock Stars. With an anticipated release for this winter on Steam, Xbox One, and PS4, this fast-paced, puzzle-filled, super-attack of a ride is easy to get excited about. CGM had a chance to sit down for an open-mic with Tyler LaGrange, the Technical Director at React! Games, to get a preview of their exciting new title. CGM: So how did you get started on Super Dungeon Bros.? Tyler LaGrange: Actually it was an OUYA game jam. We had ten days to work on it, so we kinda came together as a team and said “hey, let’s work on something fun that’s not a mobile title.” OUYA was android based but still console-ish. So we sat down and just kinda brainstormed a bunch of ideas, and the one stuck with us was Super Dungeon Bros. and then went from there. CGM: Did you go into the game jam knowing that you wanted to do a dungeon crawler? TL: Well, it was actually going to be even easier. We were actually going to start with a 2D gauntlet clone. We thought we could get that done in 10 days. So it kinda started with that and evolved from there. It just got bigger and bigger. And as we were playing it more, and developing the ideas, we really liked it and it just kind of stuck with us. We developed it on our own free time for a long time since then. CGM: So where did the rock and roll, frat bro theme come from? TL: We were really just brainstorming — just throwing any ideas out. At one point, we had an idea that they were going to be office workers kind of in the vein of The Office or IT Crowd. And they were just going to be fighting bad guys in their office. So just a bunch of brainstorming — any idea was good. And somehow we got onto four frat bros in a dungeon and a rock and roll theme. It was more about “being awesome” — a rock star attitude more than the rock star music. It stuck with us. And we named them all rock star names and developed it from there. CGM: After you left the game jam, what made you decide that this was going to be “the thing”? 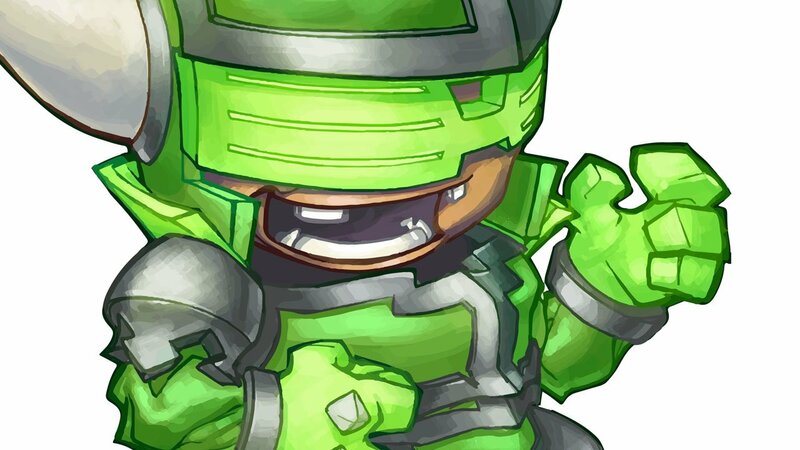 TL: We went back to doing client work but we were still really into Dungeon Bros, so in the evenings and whenever we had down time, we kept working on it. 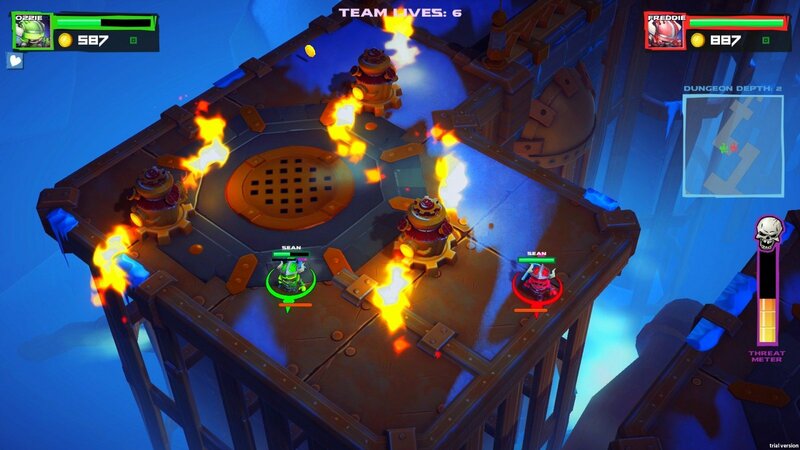 Our biggest challenge was that we didn’t have the time and resources to make the game that we wanted to make, until we met Wired Productions, who’s our publisher, and they funded it to make a Steam, XBox and PS4 game. It’s pretty rare, so we were really happy to find the right people and make that deal. CGM: Tell me a bit about the game. 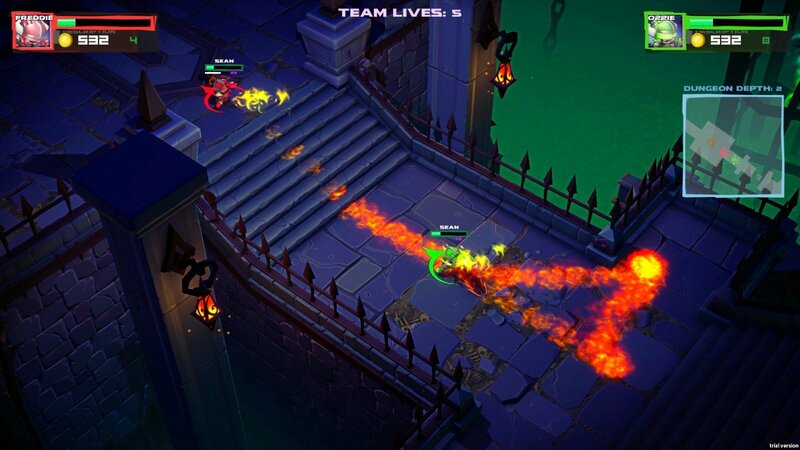 TL: It’s a four player, co-op, dungeon crawler, kinda roguelike. You start fresh each time. The dungeons are procedurally generated. You level up your weapon over time through that single gameplay session. You also get stuff to unlock certain weapons later, so the weapons and the leveling up of the weapons is your progression. You can also unlock some skins and that kind of thing too. But really, it’s all about the 4-player co-op, or “Bro-op” as we like to call the experience. You do a lot of moves together — you’re stronger as a team. We also have the online and couch co-op play. We’re doing an XBox One to Windows 10 crossplay. We’re also looking for a PS4 to Steam crossplay, as well. So it’s really just about playing with friends and having a good time just beating up bad guys. Couch co-op was our primary focus, but in this day and age, you need to have the online play. I mean, your friends are everywhere, so we want you to be able to play wherever your friends are. We’re still going to have match-making, so you can still jump on by yourself and play with three other strangers if you want to, but primarily you want to play with your friends. CGM: So you were saying “you are stronger as a team.” Does that mean there are special combo attacks for four players or pairs? TL: So each weapon class has their own “Bro Formation”. You can do them individually, but if your teammates are there, they all get stronger. The sword guy has a “Bronado” that he uses to spin around and kill any bad guys that are around him. But you can stack all four of your bros on top of you and do a bigger “Bronado” and it does a tonne of damage to anyone you hit. The attacks all get stronger the more players you add into them. The hammer guys have an attack where the slam the hammer down to cause an explosion. If your bros are close to you, you do a bigger explosion. And then there are a lot of puzzles you have to solve as a team as well. You can throw your bros across a crevasse you can’t jump across to unlock bridges, you can stack on top of each other to reach higher ground, things like that. CGM: So what do you think sets this apart the most from other dungeon crawlers that are out there right now? TL: I think the fact that we’re focusing a little more on co-op than playing by yourself. 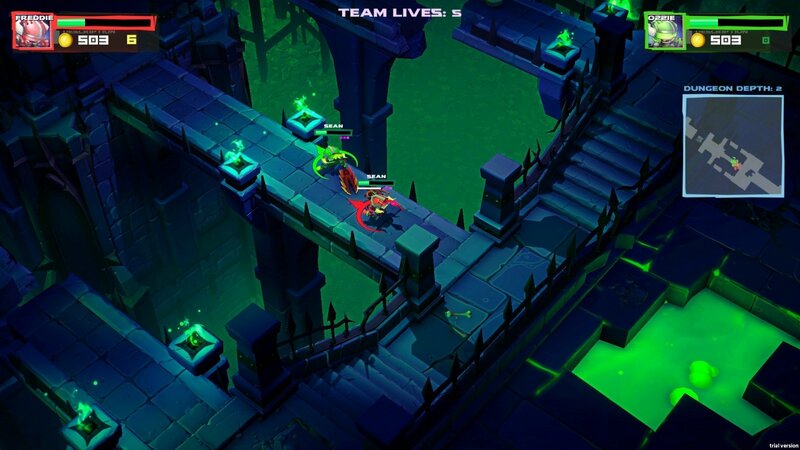 A lot of dungeon crawlers you can play by yourself — we want you to play by yourself too — but I think the bonus of playing together with your friends kind of sets it apart. And couple that with the theme “Frat Bros” — we’re doing some [new] things. And of course, we’re still working on it. It’s hard to set yourself apart in anything these days, but we’re working hard at making it better than any other unfunded indie can do, since we have the funding and resources. We’re trying to take a little more time to put a little more into it to make it a polished experience. CGM: What’s your favorite feature of the game? TL: That’s a tough call! In the original game jam, my idea was to do this “Bro Banter” system, which we have in the game now. It’s not quite as robust as I had envisioned it in the initial offset. They talk to each other. They randomly say things to each other and then respond to each other. I mean, if you were fighting in a dungeon with your bros, you would say things to each other and just have a fun time. So that was something that I really liked. And the version we have now is pretty good, it’s just that it was harder to make it too dynamic and higher professional voice actors to do enough different things so that it doesn’t get on your nerves after a while. We have some good voice actors on the game, and it sounds really neat. It’s fun. CGM: So what are some of the challenges you’ve experienced on this project? TL: Being a technical director, all the challenges I’ve experienced have been mostly technical. The networking has been a little bit daunting because we’re using cutting-edge technology from Unity. It wasn’t even out when we started working on this. I met with the guys last year at GDC and talked with them about their technology. They were excited. They were ready to start doing it. They needed a good production game to start working on it with. At Unity, they can test a lot of things, but they don’t do real world games. So they gave us early versions of software and gave us some assistance on how to get it all integrated. They helped us get things going and get the technology behind it. In return, we help them find bugs and make it all better. CGM: Anything else you would like to tell our readers? TL: We’re making a the game that we want to make. Not fully all out there. We have the funding to make a version of the game we want to make. It’s been a brilliant opportunity because that’s hard to come by. We’re excited to get it out there and have people enjoy it and give us some feedback. We’d love to develop this into some kind of franchise and have Super Dungeon Bros 2 or something else along those lines. We want to be vocal members of the Steam space and get feedback and hear what everybody thinks about it. We’re just excited to be working on a game we really like, a game that’s come from our own brainstorming, and a game that Wired has helped us get to the finish line.